As I went a few days ago to the Breitling boutique in Paris (10 rue de la Paix, Paris, France), I was reminded by Yohann (watchmaker's shop of the Breitling Boutique in Paris) and I was invited to come back and take pictures with the consent of Guillaume (Breitling France). Photos made ​yesterday night between 6:45 p.m. & 19.00, very fast, thank you for Yohann taking these photos. Pictures taken without flash, behind glass, because it has no right to manipulate these watches collection. Guess what, I have 2 of these 10 Navitimer watches (1809 Pizza and the ChronoSlide), great no? Wonderful pics, thank you ! 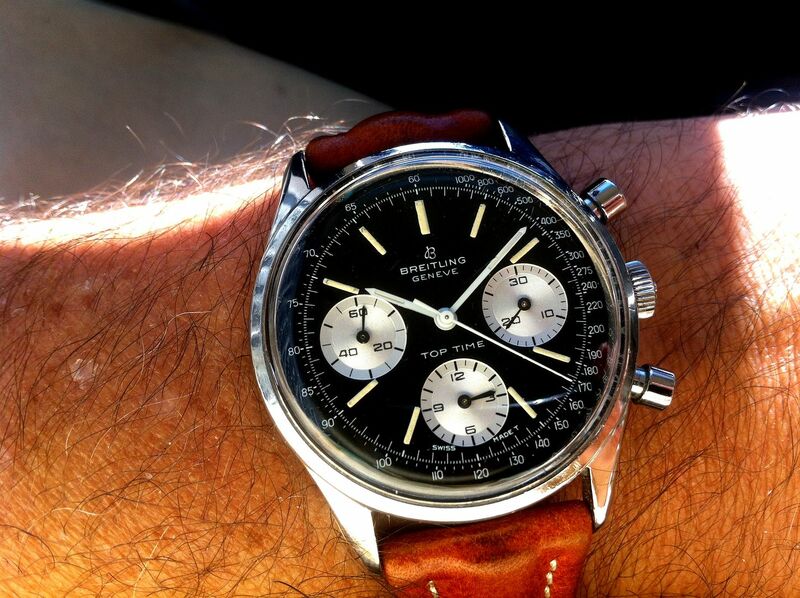 Just a small correction, watch #2 is not a transOcean, it is a 765 AVI Co-Pilot. Some interesting pieces there, although to my eye at least one, and maybe 2 are less than 100% original. confusing, which transOcean do you mean? and it is NOT a Navitimer. The theme is "Navitimer from the begining to the 50th anniversary" for these watches and with a dedicated showcase exhibition with 10 of the 500 special blue 60th anniversary watch (only 4 left now with numbers below 100). So 10 watches and the Chronoslide and the Quartz LCD watch. would not have thought the 765 Co-Pilot or AVI reminded you of the current TOC, which has very different roots, but now I understand what you mean. Thanks for the great pics, but even if Breitling puts the 765 in a Navitimer display case, it really has nothing at all to do with the Navitimer line, but is based on an early 1940s chronograph, adapted, you might be surprised to learn, to the design specifications of the French airforce in the 1950s. The watch I prefer in this exhibit is the number 8, the Blacksteel one, Never seen one before, as the Breitling staff in France and in the Boutique in Paris. Number 8, if I count correctly, is a Navitimer 7806, based on the Valjoux 7740 - a spinoff design of the Cal. 11/12 development of the late 1960s. The 7806, launched in 1967, was the first Breitling with the date complication at 5 - something that survives on the Navitimer line until today. There was a bicompax version too, the 7806-S, with the date at 6.
like I wrote, ref. 7806.
not totally convinced, frankly, these were really produced in blacksteel by Breitling, we have seen 2 or three examples, one in Jean-Michels "collectors" section, one offered - with strange hands - by a seller we all distrust from all our hearts; with good reason, I think. Nowhere did I find any reference in advertisements or catalogs that mentioned this 7806 version, surprising, frankly. the hands on this one are definitely not original to the watch or any Breitling of the early/mid 1970s actually look like Sinn - would almost bet the watch carries a 1974/1975 serial number, like many other watches that were assembled from spare parts when Willy Breitling sold off his stock before closing down the company.